Contemporary Jazz Fusion, mixing sounds from Afro Latin, Brazilian and Flamenco Music. There is a border between music genres - jazz to blues, Flamenco to fusion, rock to pop, that, when crossed successfully, creates a sound you want to hear more of. It is just this crossing of borders that Venezuelan-born drummer/composer Jose Duque masters in his latest album, Gathering in Blue. A colorful, melodic mix of odd meter, minor blues, Flamenco scale and Latin rock, all skillfully complementing a jazz groundwork, Gathering in Blue is at once melancholic and joyful, complex and startlingly simple. The range of sounds in the new album, released in June 2004, derives from the many and varied sources that have influenced Jose Duque since his childhood days in Caracas. The pensive "Counterpoint Café" came to life in an Algerian restaurant with the same name, and its Camilo-esque style speaks to a longing for old friends and warm cultures. "Where the Heart is", with its Flamenco rhythm, creates as well a longing for home. The title track, "Gathering in Blue" has an unpredictable, magical sound based on an odd meter, opening with a unison melody, followed by a dispersed and sparse sax solo, and then the full band gathering in a minor blues. The result is primal and simple, powerful and elated. Duque's music is cinematic, relating more to images than words. There is an open sound to the album; one can envision a prairie, an open landscape, blue skies, nostalgia. When asked who would most appreciate the new album, Jose answered "anyone who likes jazz but also has an open mind to it." Influencing Jose are favorites Pat Metheny, whose style is most prevalent in "Horizonte", as well as Bill Frisell, Bill Bruford, Thelonius Monk and Michel Camilo. Joining Jose to form ZumbaTres are top musicians from the Seacoast New Hampshire area, including pianist Jeff Auger, bassist Jesse Stern, guitarist Chris Weisman and saxophonist Chel Illingworth. The origins of today's ZumbaTres is The Zumbao Trio, which featured Luis Gonzalez on guitar and Jeremy Hill on bass. The band came out with an album, Zumbao Trio, in 2001. Jose has performed with "Amaya: Flamenco Sin Limites", Venezuelan pop artist Felix Roman, Juan Francisco, Roldan Pena's Jazz 3, Flamenco y Duende, and Sara es Rara. He is also currently the drummer/percussionist for The Randy Armstrong Trio. The recording has a nice, warm , live-in-the-studio vibe that is often missing from studio recordings these days. The tunes evoke a variety of moods and, overall, they’re very tight. Tunes like “horizonte’ and “counterpoint café” have a nice Pat Metheny-influenced sound, while the title cut, “gathering in Blue” sounds like it’s straight out of the book of Bill Bruford’s Earthworks band, with its use of odd meters before settling into a burning Songo or Afro-Cuban groove. Yet these influences are more implied than derivative. “Where the heart is” a beautiful ballad on the Spanish Tango Flamenco(not to be confused with the Argentinean Tango) features some of the deepest and most meaningful writing on the CD. The recording closes with a burning samna, “azucar pa’l alma”. Overall this is a fine debut from an equally fine group of musicians. And it serves as a notice that the future of the local jazz scene is in assured and capable hands-those of musicians like Jose Duque and his ZumbaTres. 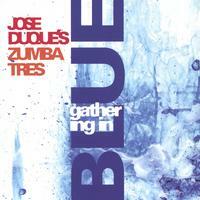 Jose Duque's drums and compositions (he wrote six of the songs in the album) managed to seamlessly blend a host of musical styles and influences in his 'Gathering in Blue', with the aid of some great musicians. The sound of Chris Weisman's guitar reminisces of Pat Metheny as much as it brings other great guitarists to mind, such as Bill Frisell and Ry Cooder. The sax of Chel Illingworth doesn't lag behind, putting the stamp of great jazz music to Jose's production. Jeff Auger's delivers chords that range from outright latin-flavored (with the aid of percussion) to straight up jazz, fusing with Jesse Stern's impeccable bass work and Chel's horn in a way that brought to mind some of King Crimson's flirting with jazz during their 'Islands' period, or Bill Bruford's "Earthworks".All in all, the album, with a very acoustic flavor all throughout its seven solid tracks, leaves you with a feel of completeness and knowing you've heard some music that not only breaks style boundaries in a succesful fashion, but also brings Venezuelan Jose Duque's to the front of the jazz territory. My favorites, hands down: the opening theme, "Where The Heart Is" and the contagious last song.